SINGAPORE COMICS & COLLECTIBLES: X-MEN UNLIMITED #10 (1996) 1ST DARK BEAST! 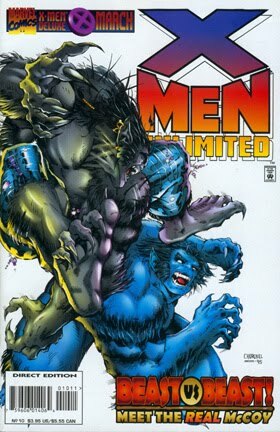 X-MEN UNLIMITED #10 (1996) 1ST DARK BEAST! • PLOT SUMMARY: Cover art by Ian Churchill. "Need to Know", script by Mark Waid, pencils by Frank Toscano and Nick Gnazzo, inks by Art Thibert; Black Beast learns about Beast's past, captures him and replaces him as a member of the X-Men; Continued in Uncanny X-Men #331 and X-Men #50.